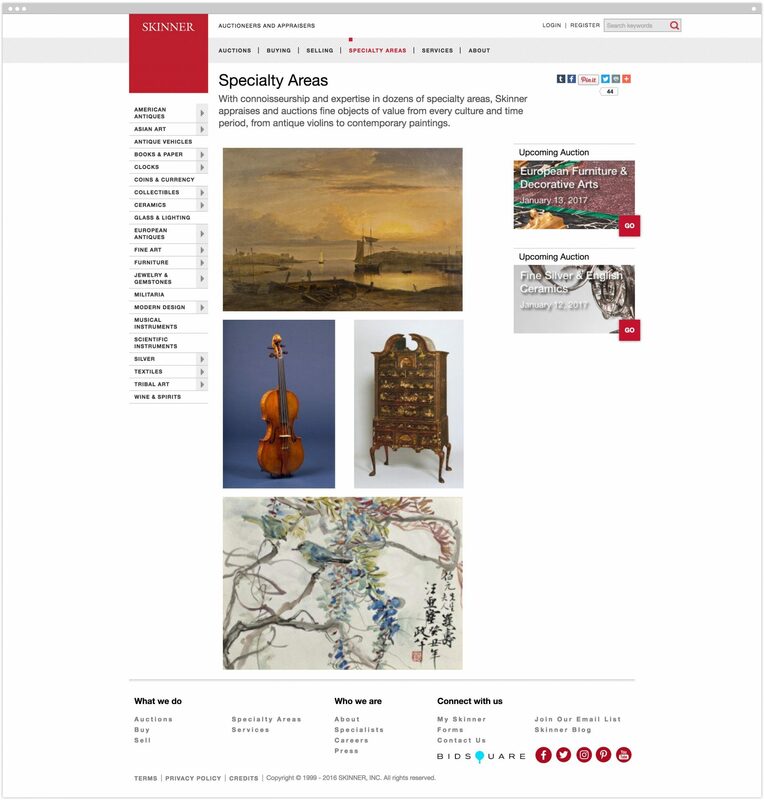 Skinner is a successful auction house, with an array of specialists and specialty auctions that attract consignments and bidders from around the world. But leadership at Skinner knew that they could further build the business by building the brand—by honing their messages, positioning, visual image, and print and digital communications—so that all always add value to both the “objects of value” and to the experience of working with Skinner. 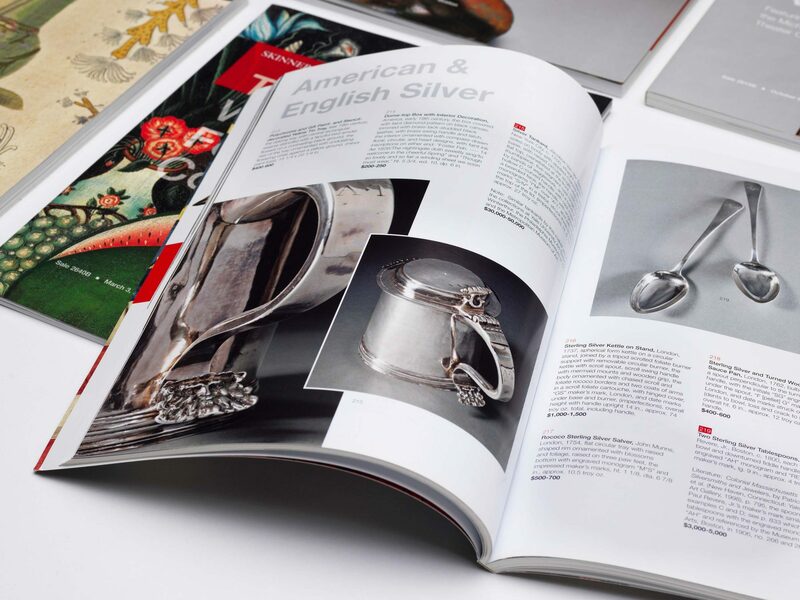 We’ve collaborated with Skinner on everything from photography, to messaging, to catalogs, to an updated identity, to a new online experience—all to increase interest, bids, and consignments. Skinner has successfully grown through the quality of our offerings, our people, our service, and our relationships. But our brand—how we looked, sounded, and the ways in which we encouraged connection and participation—was not advancing the enterprise as much as it could. Our collaboration with Sametz Blackstone has materially changed this: our new identity, messaging, visual system, catalogs, and web presence now all telegraph our value, invite people in, and actively contribute to building our brand—and business. 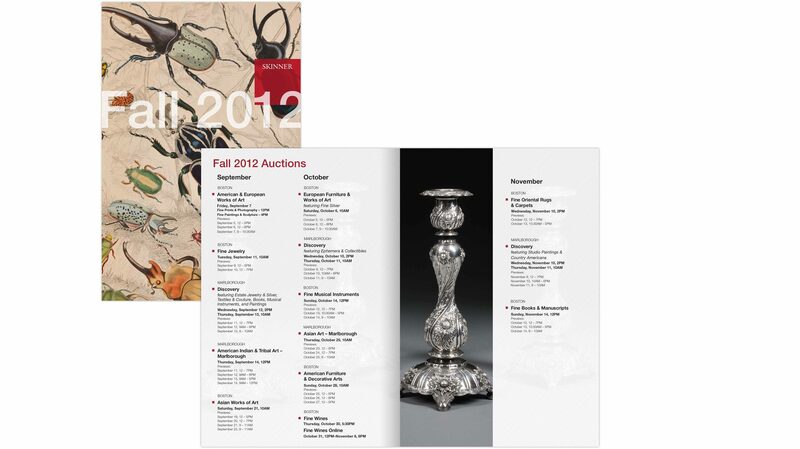 The auction landscape continues to change. While people still gather in the auction room, examine objects they’re interested in, and raise their paddles to bid, more and more, bidding takes place on the phone and online—and advertisements, catalogs, and online communication have to pique people’s interest and move them to act. 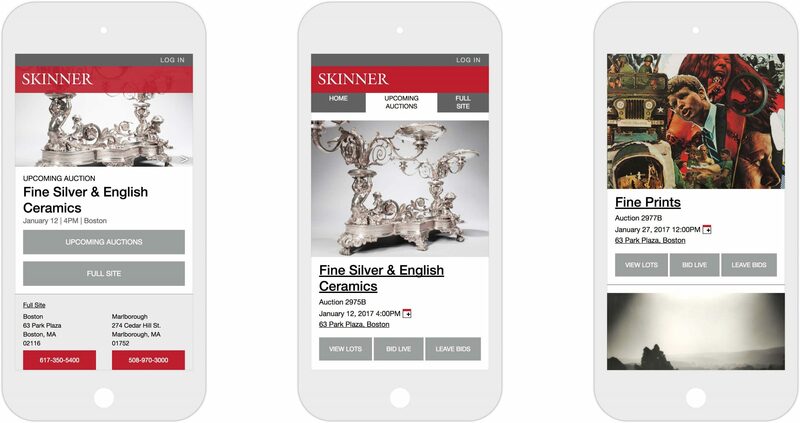 While the internet has allowed Skinner to compete head to head with internationally established auction houses, it has also made the entire auction marketplace more competitive by facilitating the rise of aggregators and specialists who can bring items to the global marketplace from anywhere in the world. With all the options buyers and sellers have today, what an auction house means and promises can be the deciding factor in attracting bidders or landing a great consignment. 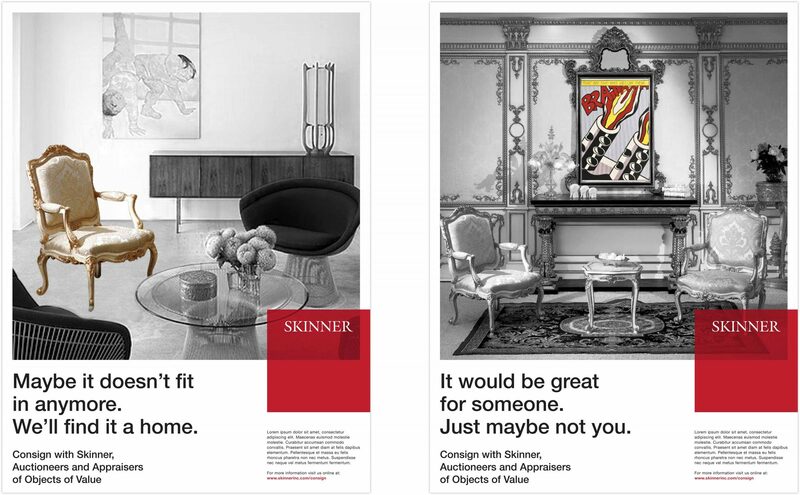 The value and values that Skinner spent years earning—trust, integrity, deep specialty expertise, personal attention—are almost more important in a new, more impersonal online world than they were when auctioneers, appraisers, prospective consignors, and bidders could meet in person. But these brand attributes—along with the high quality and desirability of items for auction—needed to be more effectively communicated. When we first began our collaboration, Skinner was a very successful operation. But it was clear that how the organization presented itself to its constituents—brand strategy, identity, print and digital communications—could benefit from a new approach. Print pieces didn’t showcase the incredible material that Skinner was bringing to market to best advantage; a dated, non-intuitive website hampered the organization’s aspirations to grow business online; color, typography, photography, identity, and tagline didn’t always present the auctions, lots, and the advantages of consigning with Skinner as well as they might. In a short three months, results from our new web presence have been most impressive— visits are up 40% year over year; unique visits are up 60%; and the new website is playing a significant role in helping our specialty auctions hammer at or above high estimates. Our work began with a comprehensive review of the organization’s brand and brand strategy. We spoke with representatives from most specialty departments, as well as from different business units across the organization. We looked at the print and digital communications of a wide swath of competitors. And we talked with customers—both long-time customers and new—to hear what the brand meant or could mean to them. With findings in hand, we worked together to clarify the brand’s foundation—Skinner’s brand attributes, model, areas of focus; more clearly articulated the organization’s positioning in the marketplace; crafted a new tagline, and assembled high-level messaging for both the sell- and buy-sides of the business. Our design team then got to work translating strategy into a new visual system that would bring Skinner’s brand more to life. To be perceived as “auctioneers and appraisers of objects of value,” Skinner’s identity and the design of print and digital materials needed, themselves, to be objects of value: elegant, curated, functionally and aesthetically pleasing. There was also the need to build in flexibility: their mid-level Discovery series of auctions required a different presentation from a higher-end 20th Century Design auction, for example. 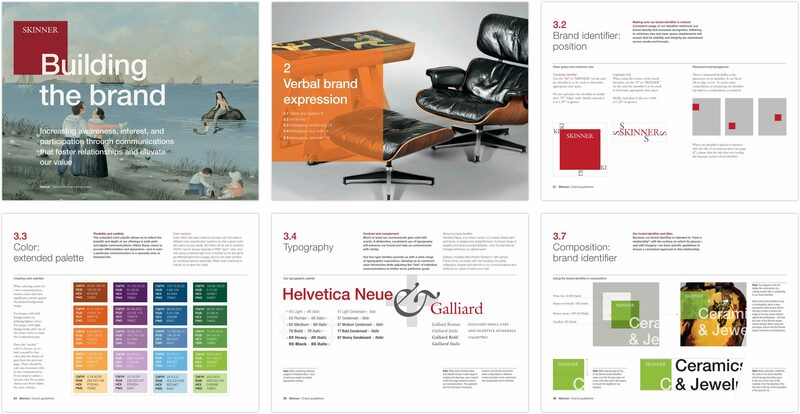 The system that evolved is anchored by a bold approach to imagery—one that allows the objects themselves to shine—combined with a distinctive approach to typography and color. The resulting affect is fresh, modern, refined—and absolutely recognizable. The system is documented in a brand guide, which was supplemented by training workshops, allowing Skinner to take ownership of the system quickly. We are ‘auctioneers and appraisers of items of value’ and as such, it’s important that all our communications are themselves, inherently “items of value.” Our new brand system—and our new identity, catalogs, marketing pieces, and new website—now work together to advance the attributes we want to be known for, encourage interest and participation, and re-affirm at each turn why someone would want to engage with Skinner. At the same time, Sametz Blackstone worked with us to ensure that the new system was built to facilitate our highly demanding production schedules—to make it easier to photograph, design, print, and code communications that increase participation and work hard to build the brand. In parallel with development of the new visual system, we collaborated to scope, design, and build a dynamic new website that integrates a multitude of external content and data sources. As a first handshake for many new prospects, www.skinnerinc.com is a both a critical brand-building vehicle and an important tool to build the business. Serving up an exciting, satisfying, valued experience for auction experts and first-timers alike was of paramount importance. 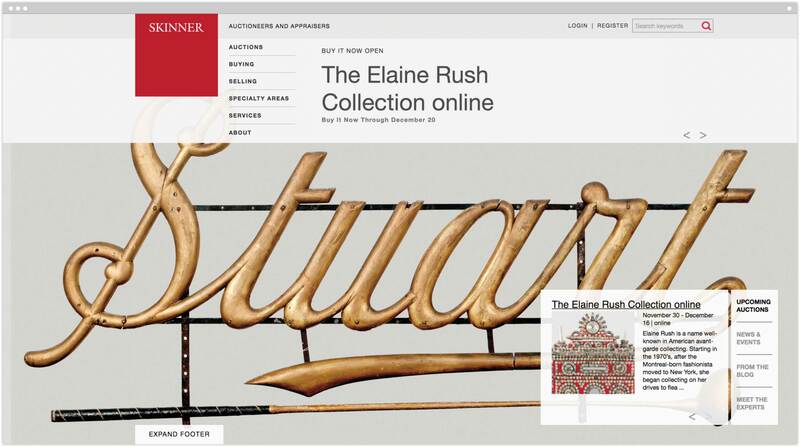 Launched in February 2013, the site is as beautiful as it is functional; communicating the value of the unique objects Skinner buys and sells, as well as the urgency and excitement of the live auction experience. 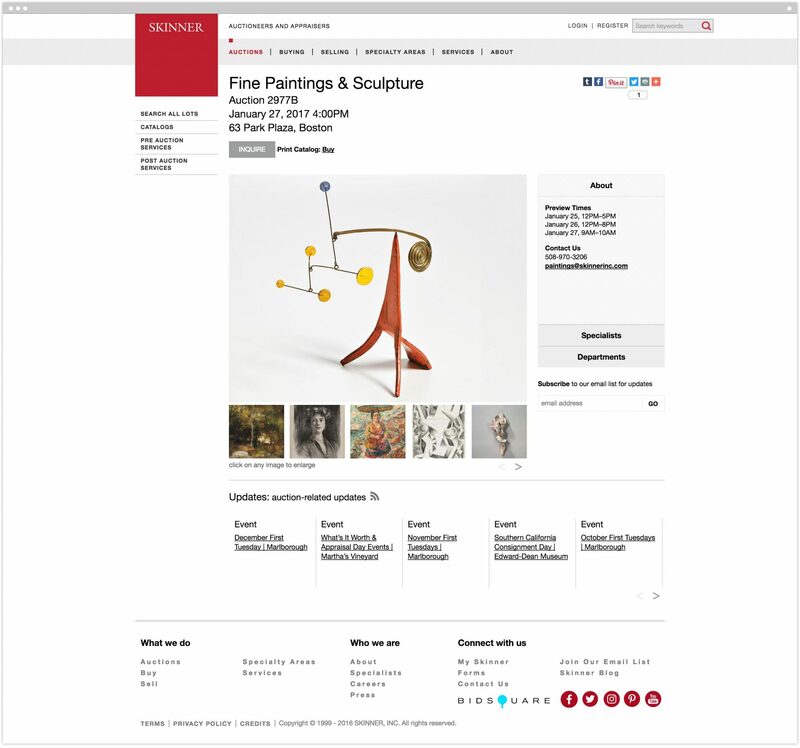 And it has already delivered impressive results: compared with a year earlier, web traffic is up 40%; unique visitors are up 60%; Since the new online auction platform was launched, two thirds of specialty auctions have exceeded their high estimates; and online bidding has accounted for up to 45% of hammer in some auctions. 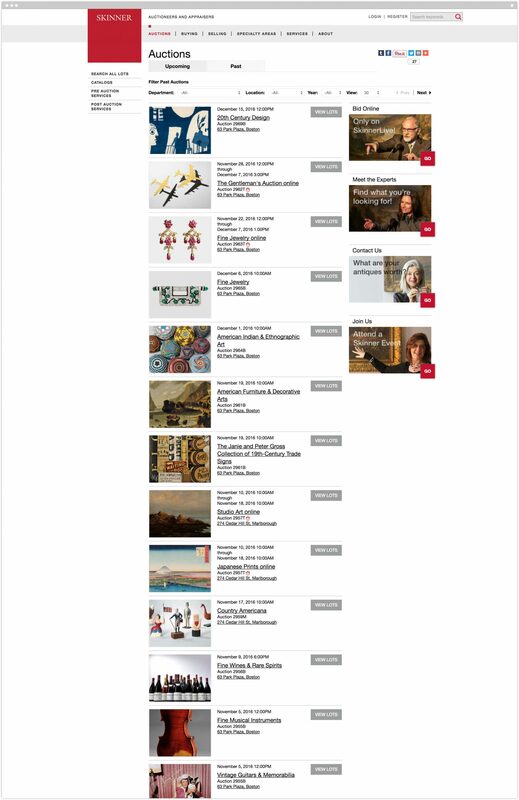 User response to new web features and to the new catalogs has been overwhelmingly positive. And this is in only three months! We’re excited for what lies ahead for Skinner. Now that the organization’s brand—and branded communications—truly express where the business is today and its value to both bidders and consignors, the Skinner brand is actively contributing to building the business, which, in turn, will further build the brand—and build even more business. A custom wordmark and the "Skinner Square"